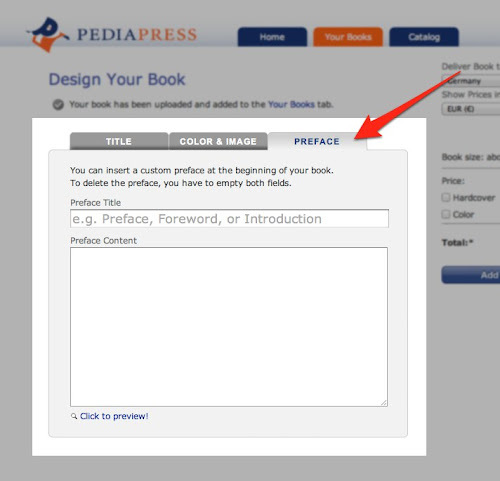 Starting today you can add a custom preface to your book. All you have to do is to navigate to our shiny new tab (aptly named "preface") after uploading your collection to PediaPress. There you can get your creative juices flowing and start writing. Personalize your book with a custom preface! The preface will appear at the beginning of your book. There is no limit on the amount of content that you can put into the preface. The price for your book will be adjusted by the estimated number of pages that you entered (by 4 cents per page). You can check out the appearance of your preface in the book preview which will be automatically updated as soon as you edit the title or content field. You are free to use basic MediaWiki Markup to enhance the layout. We consider the preface to be a part of the content of your book and use Arabic numerals (1,2,3,…) to count the pages. Only the table of contents will be numbered with Roman numerals (I, II, III, …). The chapter or article following the preface will always begin on a right (recto) page to distinguish it clearly from the previous section. This means that your book will always grow by at least two pages when you create a preface. To remove the preface you have to clear both the title and the content field. You could use this for creating personalized gifts: Just create a headline and leave the content blank. This will basically create two (almost) blank pages. You can use these pages to insert a personal note or a dedication in your own handwriting. Custom prefaces have been a "most wanted" feature both in surveys and helpdesk requests and we are glad that we are finally able to provide this new feature. How do you like it? Please allow for further inclusion of books into your catalog. I know you are also looking at the Google Books option. The preface is a terrific feature - many thanks!